IIFM Bhopal M.Phil Admission 2019 in Natural Resource Management - Indian Institute of Forest Management (IIFM), Bhopal invites applications for admission to Master of Philosophy (M.Phil) in Natural Resource Management (NRM) Program for 2019-20 session. GGSIPU M.Phil Admission 2019 - Admissions to the M.Phil Programme of studies in the Guru Gobind Singh Indraprastha University through Common Entrance Test conducted by the University for the academic session 2019-20. Amrita Vishwa Vidyapeetham M.Phil Admission 2019 – Amrita Vishwa Vidyapeetham invites applications for the admission into M.Phil. in Clinical Psychology Program for the year 2019. NALSAR University of Law Hyderabad invites application for admission to Doctoral of Philosophy (PhD) Programmes to the following specializations 2019. Check out on IGNOU PhD M.Phil Admission 2019. Also look for more info on dates, eligibility and application for IGNOU PhD M.Phil Admission 2019 for July session..
Indian Institute of Social Welfare and Business Management (IISWBM) had issued a notification for Two Year M Phil Programme of Calcutta University for the session 2019. University of Calcutta M.Phil in Arabic and Persian Admission 2019 – Department of Arabic and Persian, University of Calcutta, Kolkata offers admission to Master of Philosophy (M.Phil.) in Arabic and Persian Course for the session 2019 (January) – 2020 (December). 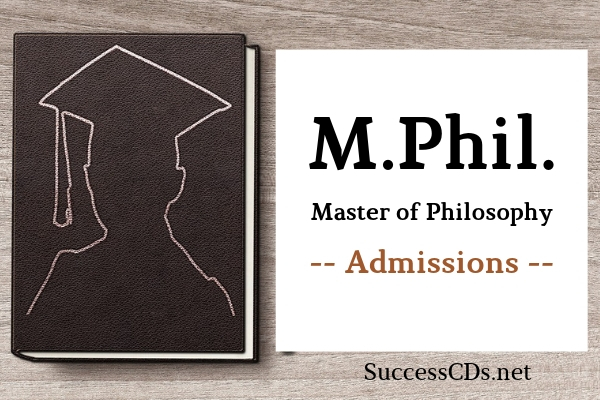 MSSV Nagaon M.Phil and PhD Admission 2019 – Mahapurusha Srimanta Sankradeva Vishwavidyalaya (MSSV) invites application for admissions to Ph.D and M.Phil Courses for the academic year 2019. Calcutta University M.Phil Admission 2018 - Applications are invited for admission to two-year M. Phil in Clinical Psychology (Self-Financed) Program (RCI approved) at the University of Calcutta for the academic session 2018-2019 . Kurukshetra University Kurukshetra invites Online Application for admission to M.Phil in Hindi, Punjabi, English, Music & Dance, Political Science, History, Sanskrit, Ancient Indian History, Cul. & Arch., Public Administration, Education, Commerce, Journalism & Mass Communication, Psychology, Library & Information Sc., Tourism & Hotel Mgt., Philosophy, Geography, Mathematics, Sociology, Economics and Botany for the session 2018-19. PT B D Sharma University M.Phil Admissions 2018 - Pandit Bhagwat Dayal Sharma University of Health Science, Rohtak (UHSR) from eligible and interested candidates for admission to M.Phil. in Psychiatric Social Work Course for the Academic session 2018-20. HPU Shimla M.Phil LLM Admissions 2018 - Himachal Pradesh University Summerhill, Shimla, Admission will release the notification for admission to the Master of Philosophy (M.Phil.) and Master in Laws (LLM) Programs in different disciplines for the academic year 2018-19. MKU M.Phil Admission 2018 – Applications are invited for admission to the following M.Phil. Courses offered by the Departments of the Madurai Kamaraj University for the academic year 2018-19. GMCH Chandigarh M.Phil Admission 2018 – Applications are invited from eligible candidates for admission to M.Phil. (Clinical Psychology) and M.Phil (Psychiatric Social Work) Course under Centre of Excellence at Govt. Medical College, Hospital, Sector-32, Chandigarh for the session 2018-20. Alagappa University M Phil Admission 2018 - Applications are invited for admission through online and offline mode to the following M.Phil. Programs offered in the University Departments for the academic year 2018-19. Jadavpur University M.Phil Admission 2018 - Jadavpur University, Kolkata invites applications for admission to M.Phil Course in Linguistics, Oceanography & Coastal Management, Women's Studies, Cognitive Science for the academic session 2018-19. IHBAS MPhil in Clinical Psychology Admission 2018 - Institute of Human Behaviour and Allied Sciences (IHBAS), Delhi has invited applications from eligible candidates for admission to M.Phil in Clinical Psychology (two years hospital based full time) course for the session 2018-20. Rashtriya Sanskrit Vidyapeeth M.Phil Entrance Test 2018 – Rashtriya Sanskrit Vidyapeetha, Tirupati is going to conduct Vishishtacharya (M.Phil.) Common Entrance Test (VACET-2018) on 30th June 2018 at Rashtriya Sanskrit Vidyapeetha. Thiruvalluvar University MPhil PhD Admission 2018 Notification- Applications are invited by Thiruvalluvar University, Vellore for admission to Master of Philosophy (M. Phil) and Doctor of Philosophy (PhD) Programs offered in Tamil, English, Economics, Zoology, Chemistry, Mathematics and Biotechnology for the commencing session 2018. Periyar University has published official notification for eligible candidates for admission into the following Post Graduate Programs at PG Extension Centre, Dharmapuri of the academic year 2018-19 . Guru Kashi University (GKU), Bhatinda invites application for admission to M.Phil and PhD Programs for the commencing session 2018 . AURCET 2018 - Andhra University Full-Time and Part-Time M.Phil./PhD Programs - Andhra University, Directorate of Admissions has issued notification for Research Admissions into Full-Time and Part-Time M.Phil./PhD Programs in Arts, Science, Engineering, Pharmaceutical Sciences and Law Faculties for the year 2018..
Online Applications are invited from eligible candidates for appearing in Sanchi University of Buddhist-Indic Studies Entrance Examination for admission to the following Programmes/Courses for the academic session 2018.